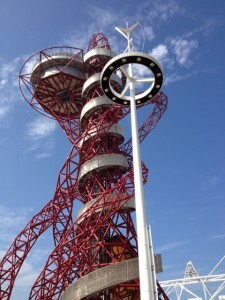 The Orbit has a legacy, but what about wind power? One of the mysteries of London 2012 is the line of seven wind turbines, their blades spinning in an elegant triple helix form, right in the middle of Olympic Park. Quietrevolution’s QR5 technology is not exactly new – you may have seen similar turbines made by the company in other public locations, in shopping centers, alongside supermarkets, close to the National Exhibition Centre in Birmingham, for several years. And yet you won’t find any information about the tantalising turbines on Olympic Park in the copious background information or in the the many articles written about the games. This is because of the confidentiality agreement which the organizers strike with companies directly involved with the Olympics. That prohibition doesn’t apply, however, to another of the company’s turbines which stood above Portland Marina in Dorset – the venue for the Olympic sailing events. It is said to be capable of producing up to 7,500 kWh of power a year if average wind speeds reach seven metres per second. This week (Monday, August 13) Quietrevolution awarded a £2m contract to Hutchinson Engineering, with whom it collaborated on the project, to supply 400 vertical axis wind turbines. I first wrote about Quietrevolution five years ago, when, for a time, the company was hinting at quite rapid production expansion. Then, apart from putting turbines in some very strategic places, things went quiet. The company’s website was hardly updated, which was surprising. There was massive media coverage of opposition to conventional turbines in scenic spots around the country, but very little mention of what seem to be a promising alternative. The point about the triple helix wins turbine, and QR is not the only company making them, is that it catches the wind from any direction, and is far less obtrusive than the increasingly massive wind turbines that significant numbers of people abhor. And, as visitors to the Olympic Park will attest, they run very quietly. When I visited the company just off the Faringdon Road in London in 2007, I asked (using a technology metaphor of the time) “Is the Quietrevolution QR5, which was delivered to the first customer this week, wind’s iPod to the clunking tape-recorder of the conventional windmill? Because the structure is smaller and more compact than traditional turbines – 5 metres tall, and about 3 m across on a 9m mast – it is less intrusive, and easier to integrate into existing and new building designs. And under test it was shown to be very quiet and vibration free. I was told that, depending on wind speed, the QR5 will generate around 10,000kW hours a year — enough to power the lights, computers, phones, faxes, printers and servers of a twenty person office, or provide the electrical energy requirement of around five energy efficient homes. I found Quietrevolution very excited about a smaller version of the QR5, capable of powering a group of houses. “If the Qr5 becomes the iPod of wind energy, when can we expect the Nano? The company is developing a ‘half pint’ version suitable for the domestic market. The 2.5 turbine, as the name suggests, would be 2 ½ metres high on a 3 m mast, 5 ½ metres from top to bottom. At the time, an announcement seemed imminent, but five years on there is no mention of it on their website. Erecting these turbines on Olympic Park may have been an exercise in environmental tokenism – one blog I read said the energy they produced would be minimal, and they weren’t the right renewables technology for this environment. Be that is as it may, all the world knows about them now. We may learn more about where the company goes from here and what the future for its turbines is once the Paralympic games are over, and they begin to deconstruct Olympic Park. For the time being Quietrevolution is one of the first firms to emerge from the games with the makings of a real business legacy.